Chapter 6, Sec. 1 - 4 Adversarial Search. 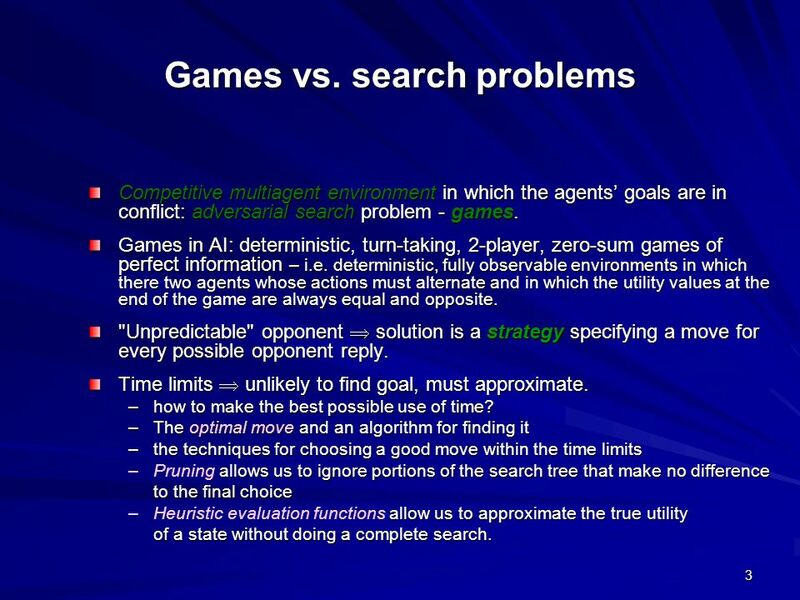 Competitive multiagent environment in which the agents’ goals are in conflict: adversarial search problem - games. 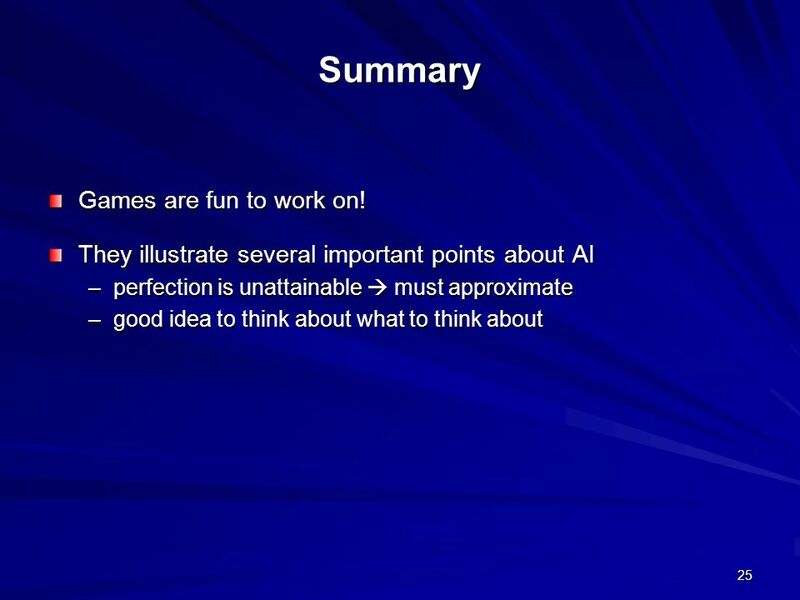 Games in AI: deterministic, turn-taking, 2-player, zero-sum games of perfect information – i.e. 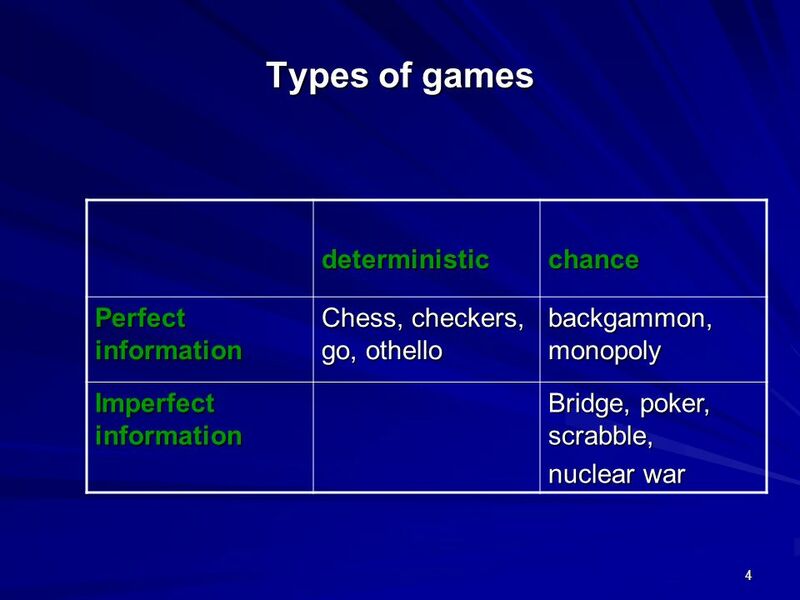 deterministic, fully observable environments in which there two agents whose actions must alternate and in which the utility values at the end of the game are always equal and opposite. "Unpredictable" opponent  solution is a strategy specifying a move for every possible opponent reply. Time limits  unlikely to find goal, must approximate. how to make the best possible use of time? 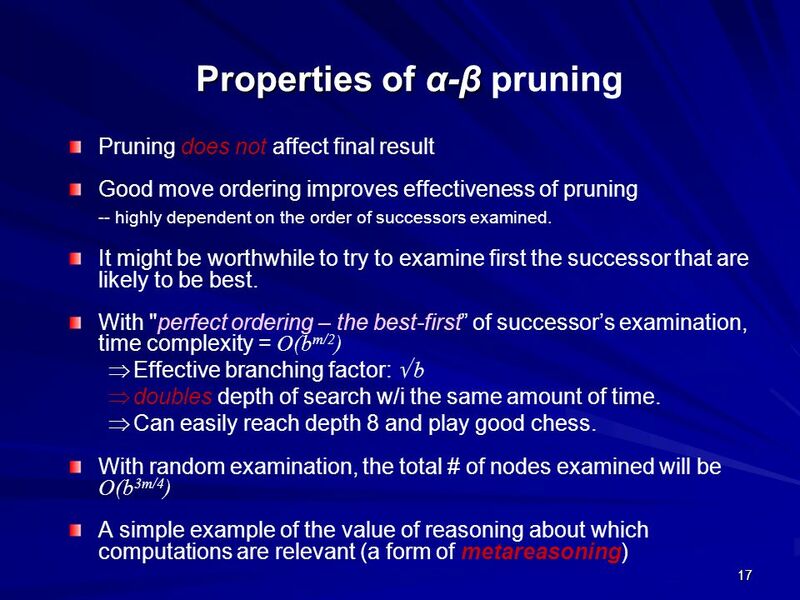 The optimal move and an algorithm for finding it the techniques for choosing a good move within the time limits Pruning allows us to ignore portions of the search tree that make no difference to the final choice Heuristic evaluation functions allow us to approximate the true utility of a state without doing a complete search. 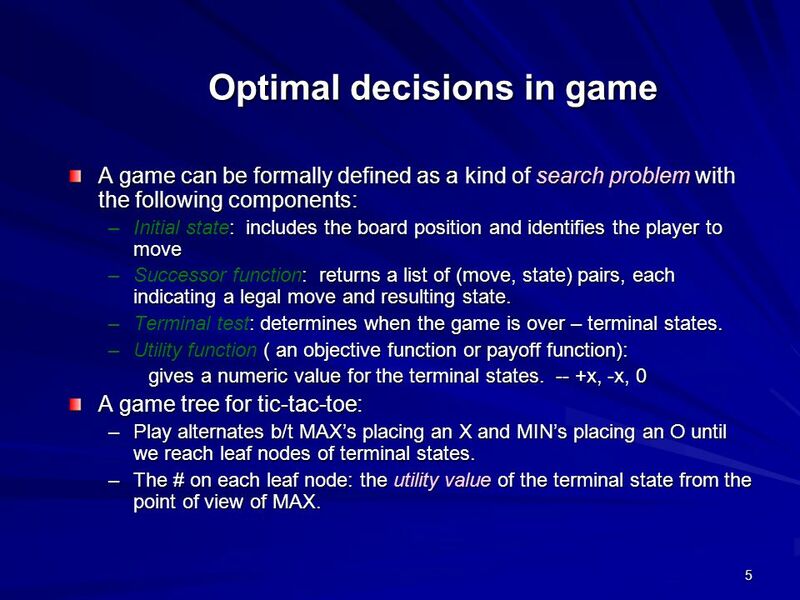 A game can be formally defined as a kind of search problem with the following components: Initial state: includes the board position and identifies the player to move Successor function: returns a list of (move, state) pairs, each indicating a legal move and resulting state. Terminal test: determines when the game is over – terminal states. 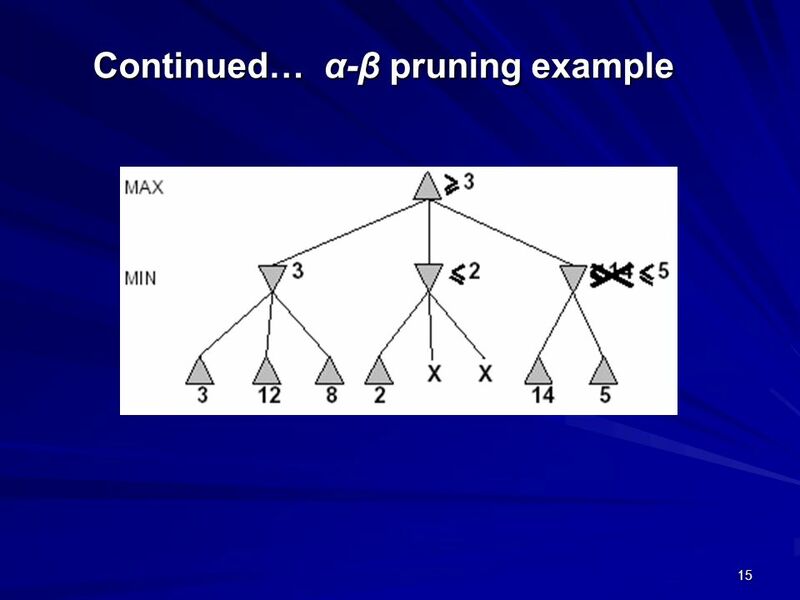 Utility function ( an objective function or payoff function): gives a numeric value for the terminal states x, -x, 0 A game tree for tic-tac-toe: Play alternates b/t MAX’s placing an X and MIN’s placing an O until we reach leaf nodes of terminal states. 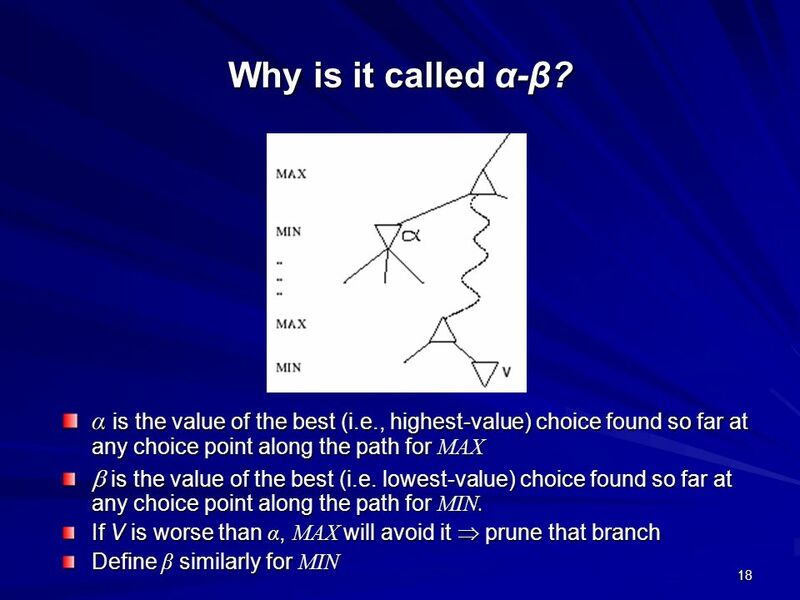 The # on each leaf node: the utility value of the terminal state from the point of view of MAX. Cf) In a normal search problem, the optimal solution would be a sequence of moves leading to a goal state in the minimum path cost. 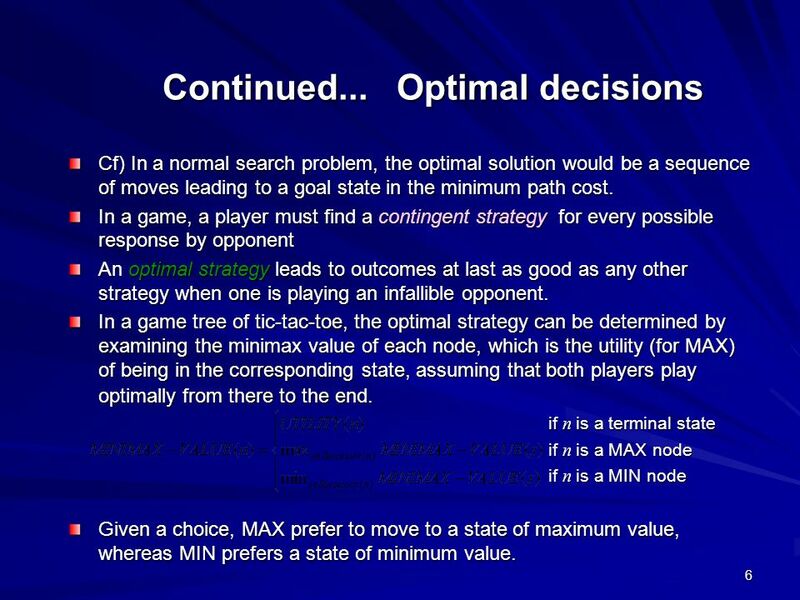 In a game, a player must find a contingent strategy for every possible response by opponent An optimal strategy leads to outcomes at last as good as any other strategy when one is playing an infallible opponent. 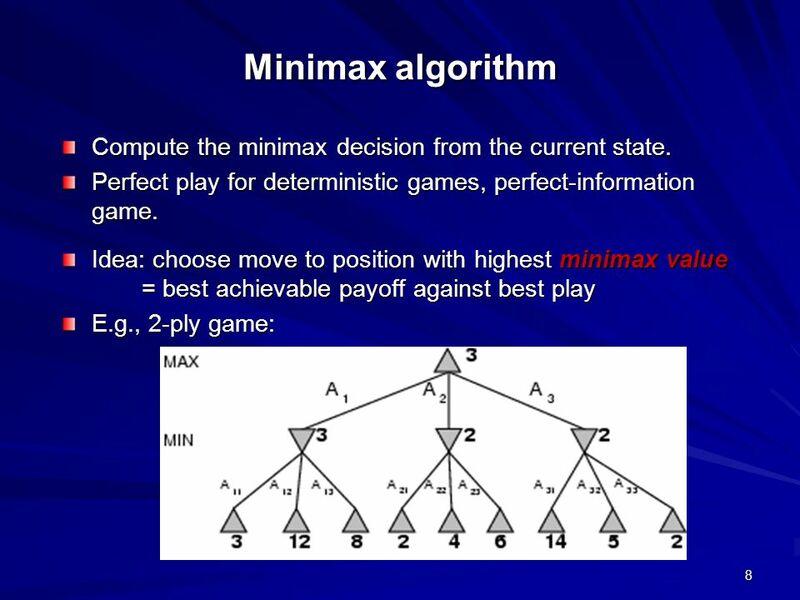 In a game tree of tic-tac-toe, the optimal strategy can be determined by examining the minimax value of each node, which is the utility (for MAX) of being in the corresponding state, assuming that both players play optimally from there to the end if n is a terminal state if n is a MAX node if n is a MIN node Given a choice, MAX prefer to move to a state of maximum value, whereas MIN prefers a state of minimum value. 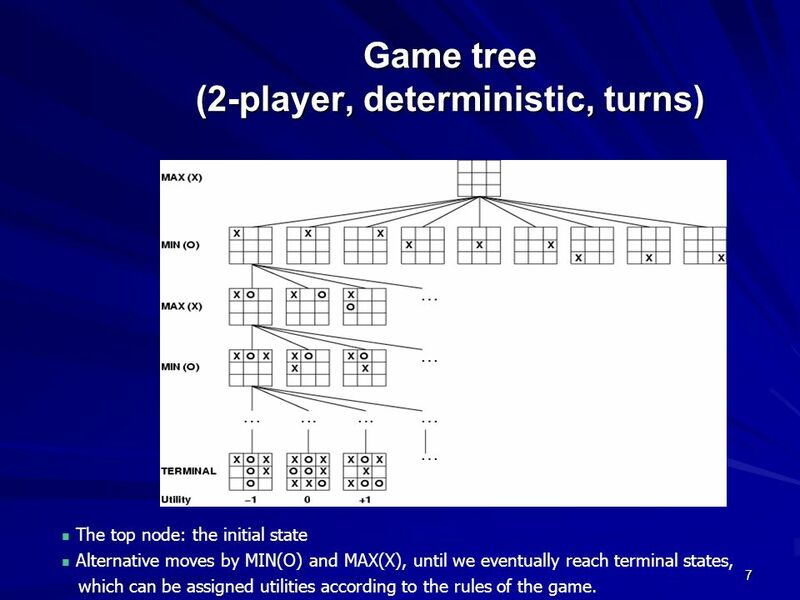 The top node: the initial state Alternative moves by MIN(O) and MAX(X), until we eventually reach terminal states, which can be assigned utilities according to the rules of the game. 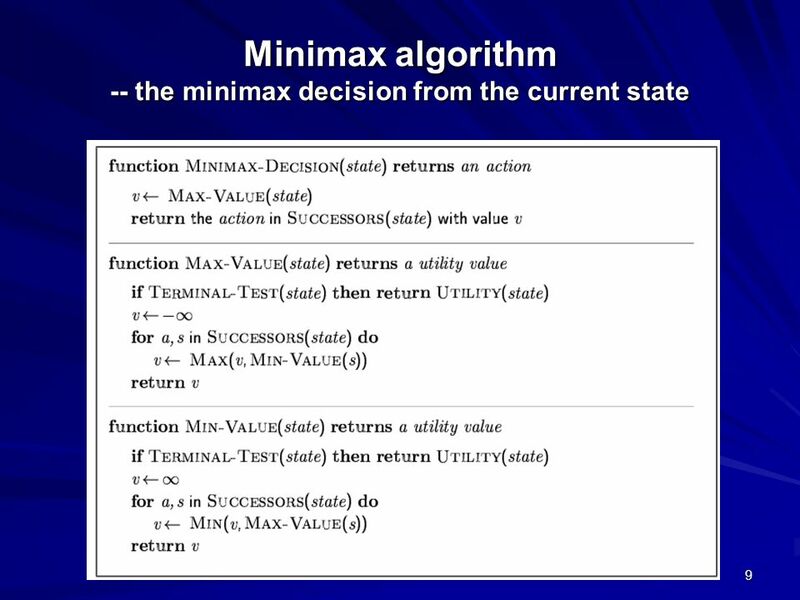 8 Minimax algorithm Compute the minimax decision from the current state. 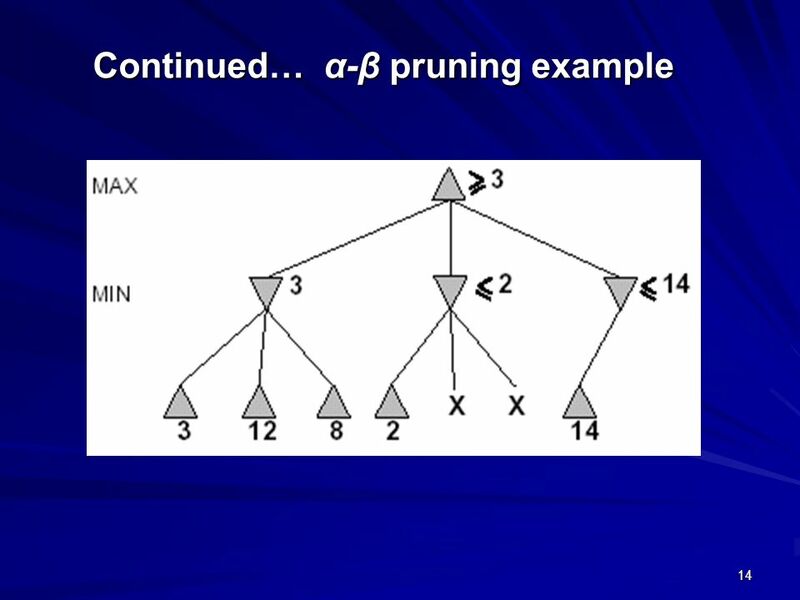 11 α-β pruning Compute the correct minimax decision w/o looking at every node in the game tree => reduce the # of states examined. 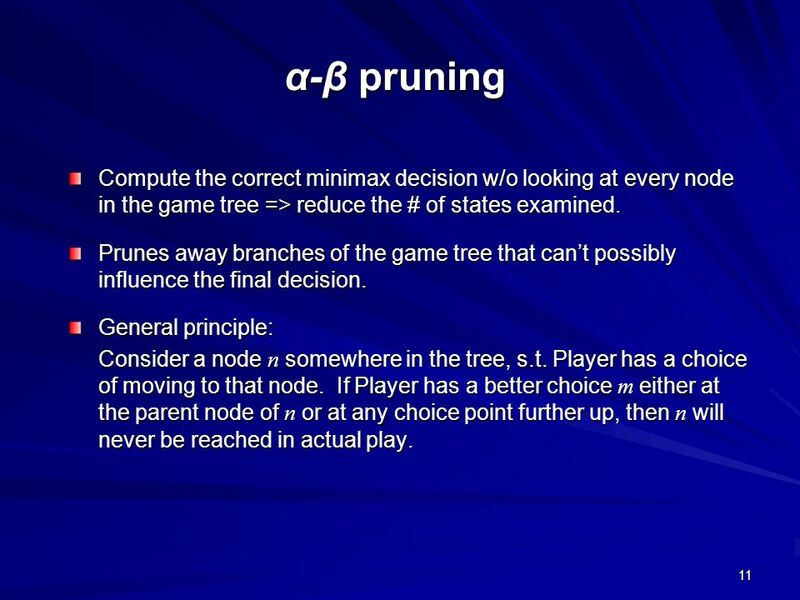 Prunes away branches of the game tree that can’t possibly influence the final decision. General principle: Consider a node n somewhere in the tree, s.t. Player has a choice of moving to that node. If Player has a better choice m either at the parent node of n or at any choice point further up, then n will never be reached in actual play. 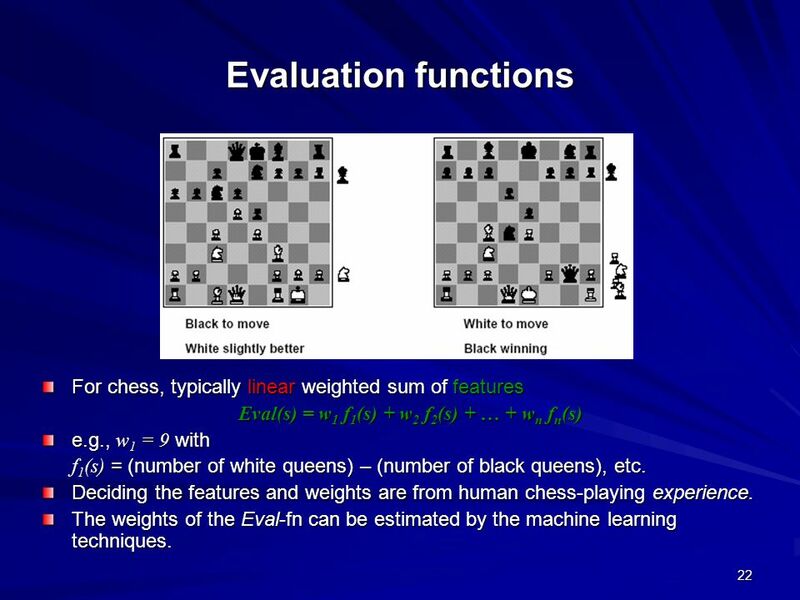 Evaluation functions For chess, typically linear weighted sum of features Eval(s) = w1 f1(s) + w2 f2(s) + … + wn fn(s) e.g., w1 = 9 with f1(s) = (number of white queens) – (number of black queens), etc. Deciding the features and weights are from human chess-playing experience. 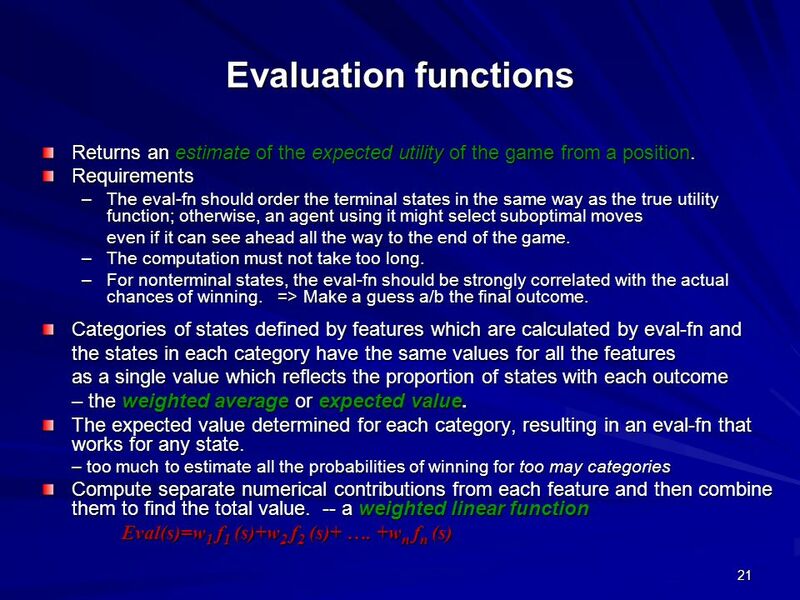 The weights of the Eval-fn can be estimated by the machine learning techniques. Checkers: Chinook ended 40-year-reign of human world champion Marion Tinsley in Used a precomputed endgame database defining perfect play for all positions involving 8 or fewer pieces on the board, a total of 444 billion positions. Chess: Deep Blue defeated human world champion Garry Kasparov in a six-game match in Deep Blue searches 200 million positions per second, uses very sophisticated evaluation, and undisclosed methods for extending some lines of search up to 40 ply. Othello: human champions refuse to compete against computers, who are too good. Go: human champions refuse to compete against computers, who are too bad. 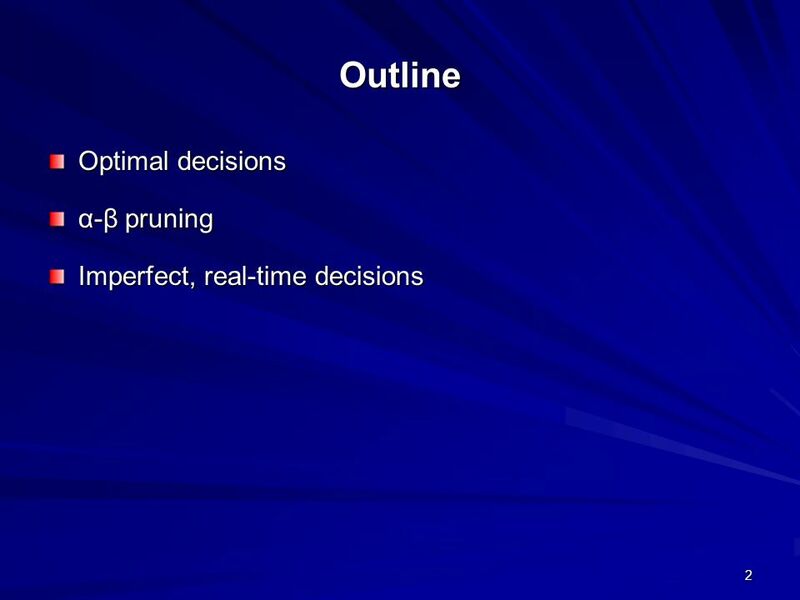 In go, b > 300, so most programs use pattern knowledge bases to suggest plausible moves. 25 Summary Games are fun to work on! Download ppt "Chapter 6, Sec. 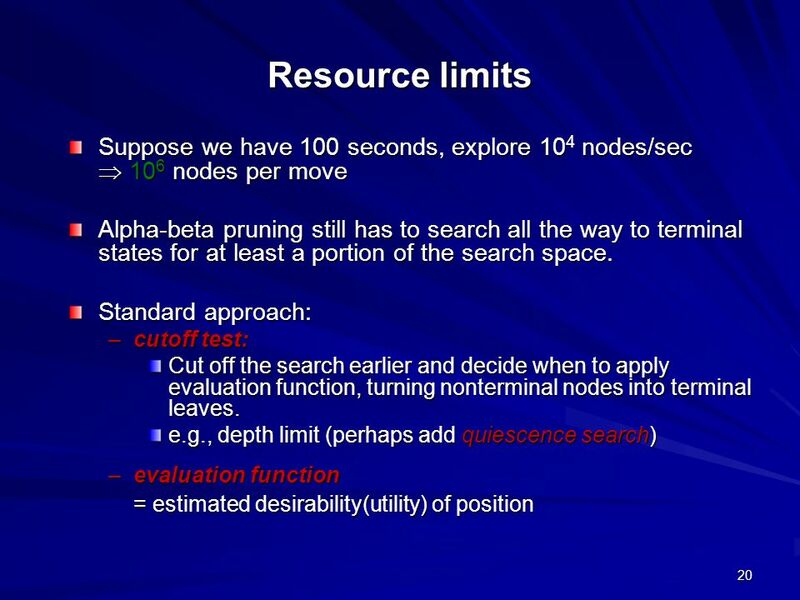 1 - 4 Adversarial Search." Games & Adversarial Search Chapter 5. 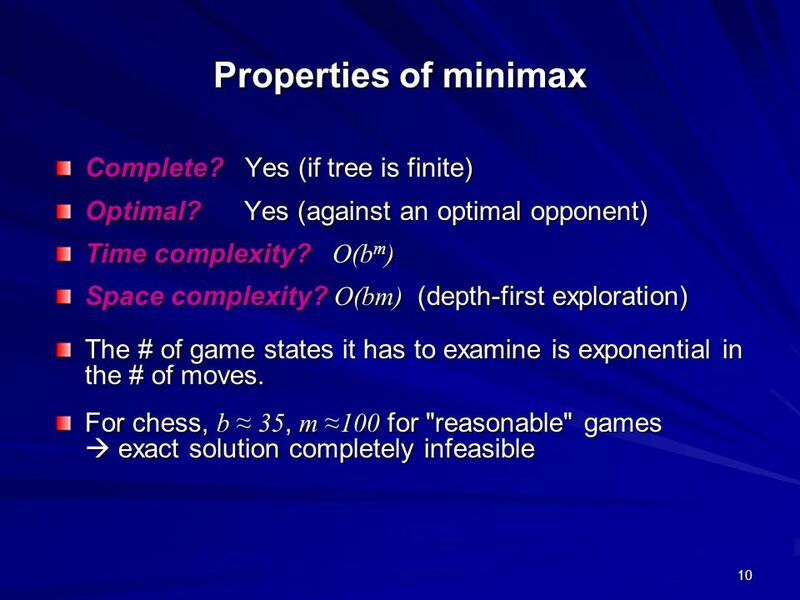 Games vs. search problems "Unpredictable" opponent  specifying a move for every possible opponent’s reply. Time. 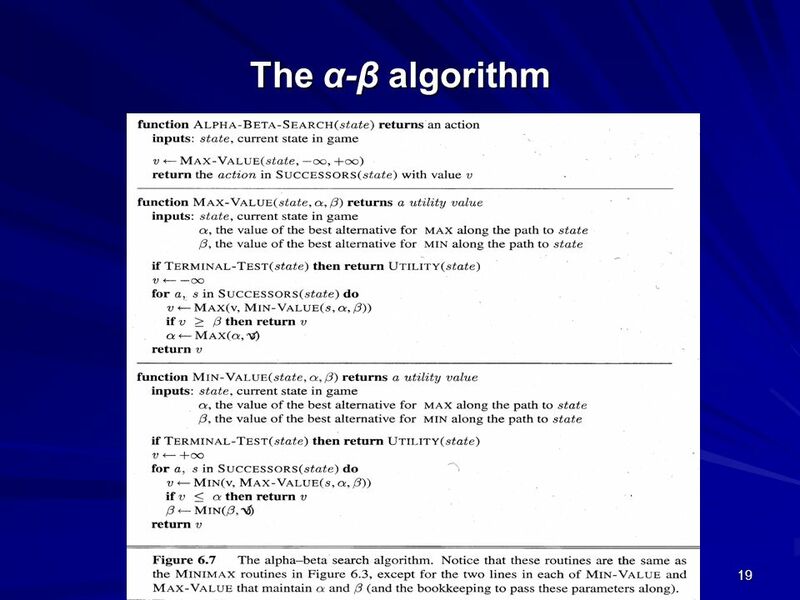 February 7, 2006AI: Chapter 6: Adversarial Search1 Artificial Intelligence Chapter 6: Adversarial Search Michael Scherger Department of Computer Science. 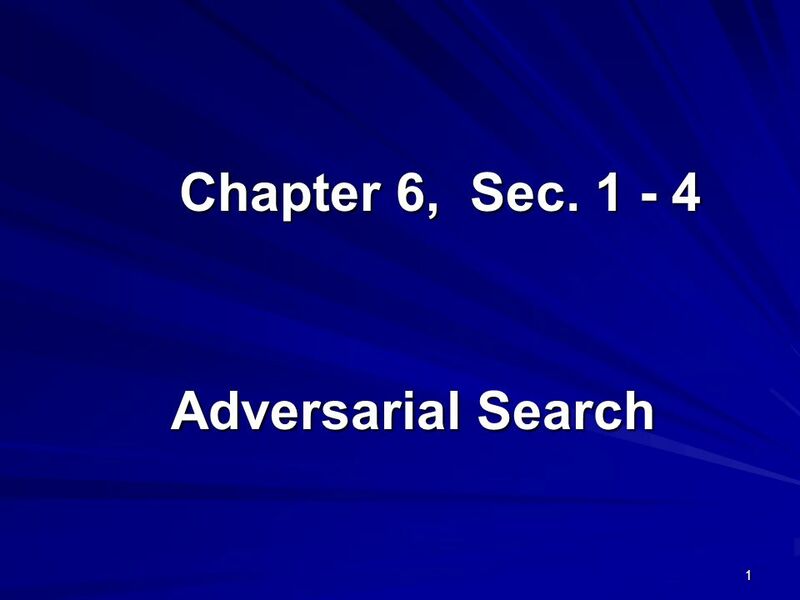 Adversarial Search Chapter 6 Section 1 – 4. Warm Up Let’s play some games! CSC 8520 Spring Paula Matuszek CS 8520: Artificial Intelligence Solving Problems by Searching Paula Matuszek Spring, 2010 Slides based on Hwee Tou. Adversarial Search Chapter 6 Section 1 – 4. COMP-4640: Intelligent & Interactive Systems Game Playing A game can be formally defined as a search problem with: -An initial state -a set of operators. 1 Game Playing. 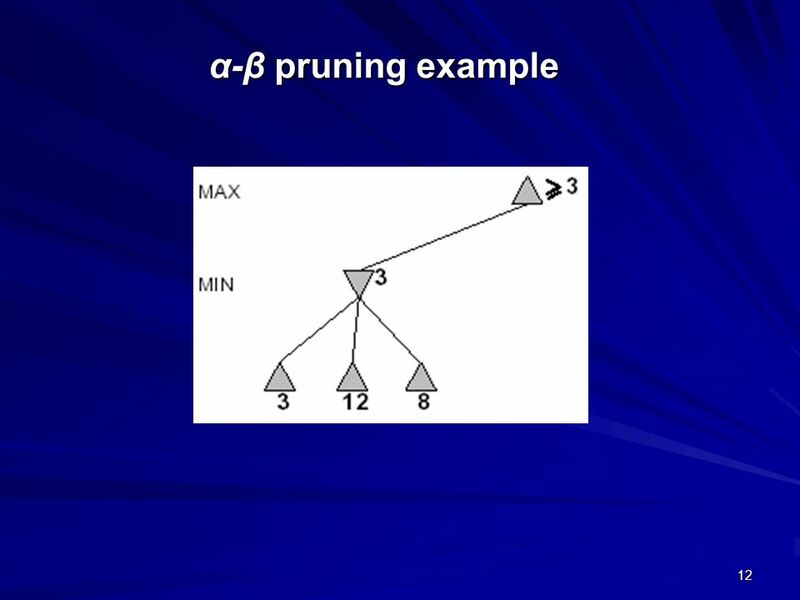 2 Outline Perfect Play Resource Limits Alpha-Beta pruning Games of Chance. 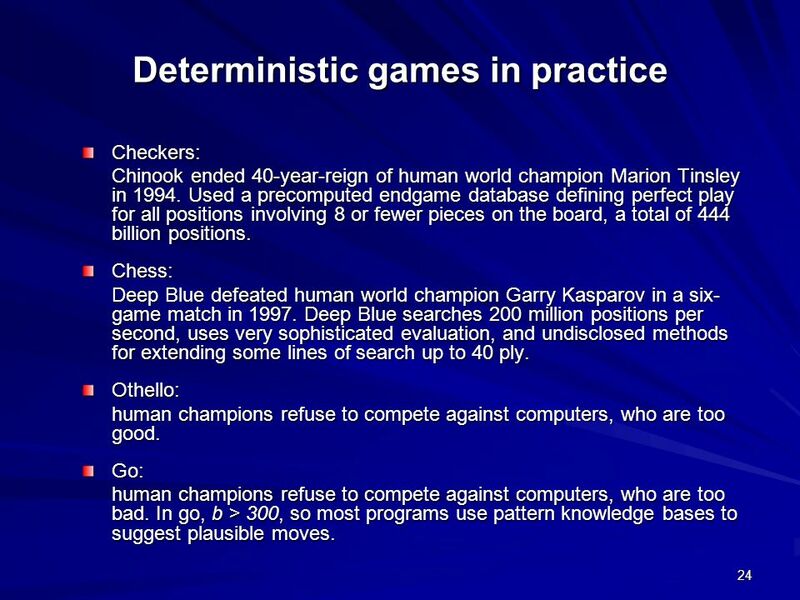 Adversarial Search: Game Playing Reading: Chapter next time. 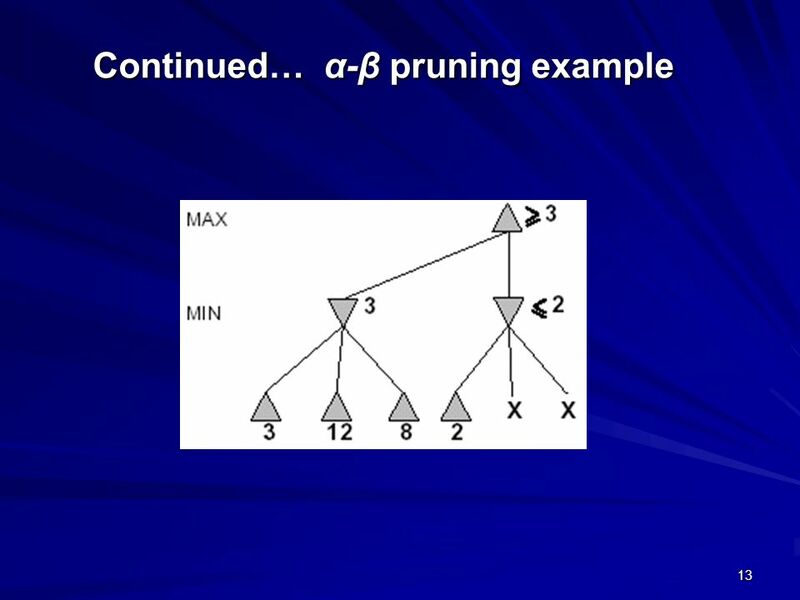 Lecture 12 Last time: CSPs, backtracking, forward checking Today: Game Playing. Adversarial Search Game Playing Chapter 6. 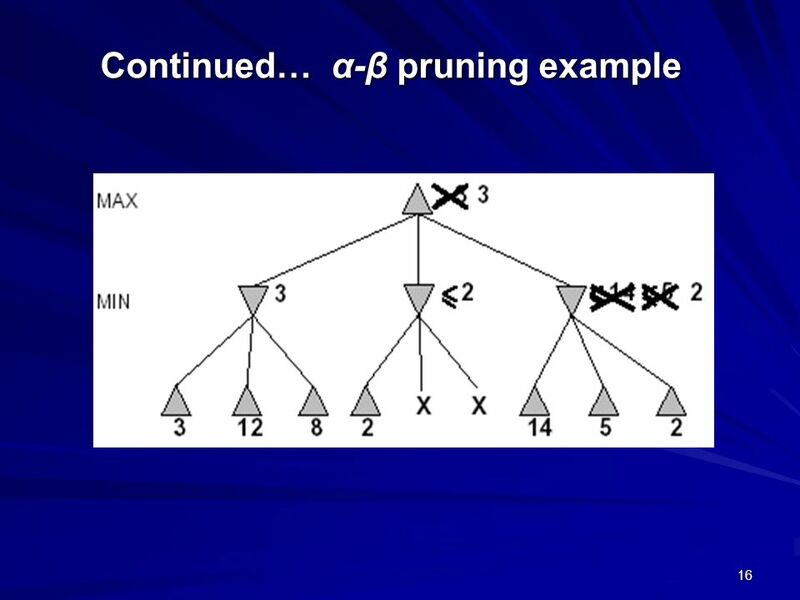 Outline Games Perfect Play –Minimax decisions –α-β pruning Resource Limits and Approximate Evaluation Games. Adversarial Search CSE 473 University of Washington. 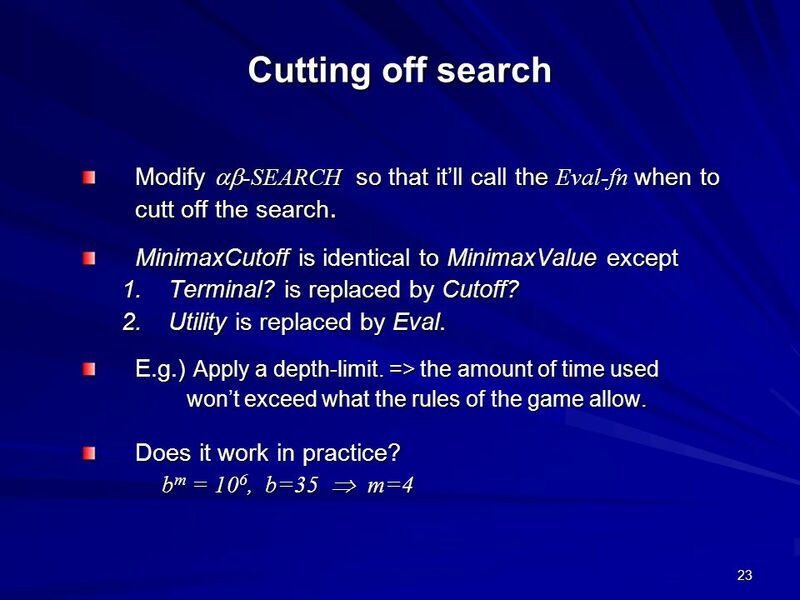 An Introduction to Artificial Intelligence Lecture VI: Adversarial Search (Games) Ramin Halavati In which we examine problems.